Each week we open our kitchen to the community. At 8:00 Wednesday mornings, we open our doors for free breakfast and prayer. Most Wednesday evenings we hold Emmaus Meals, free soup suppers that are followed by Christian education. Both times are open to the public and available to those who do or do not wish to stay for prayer or the lecture and discussion. We partner with Yohana Mazuguni and his Young Scholars School in Tanzania. Our relationship with the school has lasted over seven years, during which we’ve helped them build a water tower, fund school supplies, and assist with day-to-day needs of Father Yohana and his school. Parking lots are boring, and (as we share ours with the county offices across the street), we decided to create a labyrinth in ours. The labyrinth is not, of course, a simple maze, but is a physical symbol of meditation. The labyrinth may be walked or simply traced with the eyes. 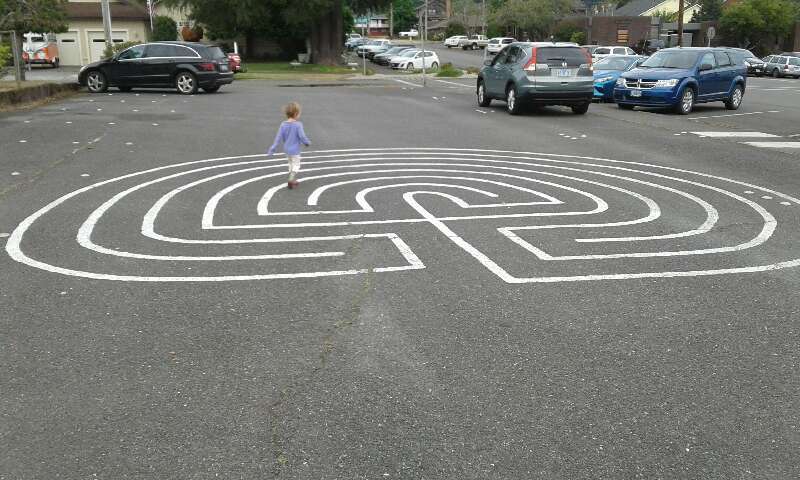 If you’re interested in labyrinths, or want to know about ours, ask one of our parishioners. Or walk it yourself! Together with other churches in the community, folks at St. James’ take part in the Coquille food pantry that serves the area.